This study has 7 sessions, incorporating an introductory session and 6 lessons. The Study Set includes the Study Guide by Little Rock Scripture Study Staff and the New Collegeville Bible Commentary, James, First Peter, Jude, Second Peter, by Patrick J. Hartin (Liturgical Press). Fr. Patrick J. Hartin, PhD, is professor of New Testament at Gonzaga University, Spokane, Washington, and the author of the Sacra Pagina commentary on James and A Spirituality of Perfection: Faith in Action in the Letter of James, published by Liturgical Press. He is also author of Exploring the Spirituality of the Gospels, which is the companion commentary to Little Rock Scripture Study's The Spirituality of the Gospels. This study covers four New Testament letters traditionally known as the Catholic Letters because each is written to strengthen Christian communities scattered across a wide region of the Roman Empire rather than a specific Christian community. Participants will discover that they contain profound differences as well as intriguing similarities. James is a work of wisdom literature, expounding on the themes of faith and good works, true wisdom, and the need for the rich to care for the poor. First Peter resembles a sermon on baptism. It is filled with moral exhortations about living out one's baptismal promises in a properly upright, faith-filled manner, especially in the face of suffering and persecution. Second Peter contains strong warnings and exhortations to avoid false teachings to maintain proper ethical conduct while awaiting the second coming of Jesus Christ. It shares much of its content with Jude, because of which, Jude is studied in conjunction with Second Peter. 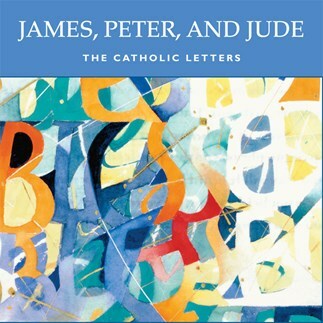 These lectures correspond to the seven sessions outlined in the Study Set for James, Peter, and Jude: The Catholic Letters.